When the gold nuclei smash into each other they are broken down into particles called quarks and gluons. These form a ball of plasma about 300 times hotter than the surface of the Sun. This fireball, which lasts just 10 million, billion, billionths of a second, can be detected because it absorbs jets of particles produced by the beam collisions. But Nastase, of Brown University in Providence, Rhode Island, says there is something unusual about it. Ten times as many jets were being absorbed by the fireball as were predicted by calculations. 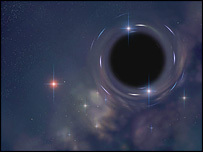 The Brown researcher thinks the particles are disappearing into the fireball's core and reappearing as thermal radiation, just as matter is thought to fall into a black hole and come out as "Hawking" radiation.